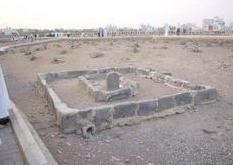 Ibrahim, the son of Prophet Muhammad (pbuh) and Maria, died in the tenth year of the Hijrah. He was sixteen months old (eighteen months old in another account) and under the care of a nurse when he died. Upon hearing what had happened to his son, Prophet Muhammad immediately went to the house of the nurse, where he held Ibrahim in his hands, and tears flowed from his eyes. He said, "The eyes send their tears and the heart is saddened, but we do not say anything except that which pleases our Lord. Indeed, O Ibrahim, we are bereaved by your departure from us." Then he turned his face towards the mountain before his and said, "O mountain! If you were as sorrowful as I am, you would certainly crumble into pieces! But we say what Allah has ordered us: (We are the servants of Allah and we will return to Him; We thank Allah, the Creator of the Universe)"
While Prophet Muhammad was grieving for his son Ibrahim, Usama ibn Zayd started to cry. The Prophet warned him not to. Usama said, "I saw you crying." The Prophet answered: "I have not commanded you against sadness, but against raising your voice in grief." While preparing the grave for Ibrahim, Prophet Muhammad saw an opening between the clay and ordered the Companions to fill it in. He filled the opening with sand and said: "Tombstones are neither good nor ill, but they help appease the living. Anything that man does, God wishes him to do well." Death is an exemplary lesson in every way for the living ones. However, we tend not to contemplate death too much for we prefer the forget the things that can remind us of it. We do not regard death as an opportunity to realize the meaning of life for ourselves and for our loved ones. Every death experienced indeed is devastating if it is allowed to kill the beauty and divinity in the outlook of those who are still alive. Those who have lost their way in the darkness of mourning and fate are so greatly removed from the viewpoint of Maulana, who considered death to be the wedding night (night of reunion with Allah). Those who do not have the strength or maturity to bear the sadness fall into a contradiction when they recite amantu billahi... wa al-yawmi al-ahiri (I belief in Allah and in the Day of Judgment). On the other hand, for those who obey the order "Frequently mention death which dispels pleasure and makes it bitter," life becomes more open to love, compassion, justice and sharing due to the fact that it does not become immured within material aspects. Therefore it becomes possible for us to protect ourselves from being devoured by certain people. After his child had passed away, the humane, yet dignified and dependable attitude shown by the Prophet as a father - a father who had lost many of his children before - removed the banality of death and transformed it into a lesson. Even when experiencing the greatest of agonies, we can see that he still maintained a lofty level in his servitude to Allah: the heart grieves, tears drop, but the tongue does not rebel. This is the act of someone who knows their limits. This is the non-offending stance of the spirit in the position of consent; shaken, yet not aggrieved. This is the lament of the heart which turns into tears in the eye and into inna lillahon the tongues. Inna lillah wa inna ilayhi rajiun means "To Allah we belong and to Him we will return." Only this can extinguish the fire within the hearts that has become a blaze. The wailing and laments that bring people to rebellion and make the tongue an excuse for fire may change the status of this pain, the essence of which is peculiar to this world, and cause it to surround the afterlife. The humanity of silently crying versus the evil of hear-rendering laments... The choice is ours. Prophet Muhammad invited the believers to goodness, which is the best form of servitude, and encouraged them to perform what is pleasant in words and deeds. "Allah who is beautiful and loves beauty" (Muslim, faith 147), revealed that the deeds become pleasant only with beautiful/reliable/correct words (qawl-i sadid) (Al-Ahzab, 70) and thus broadened our horizon from another perspective. Prophet Muhammad, whose heart was scorched with sadness for his son, encouraged his Companions to do their best when they had a task to perform. This understanding and sensitivity, which put forward the notion of looking into the future with hope and not becoming estranged from life even during an incident that could cause the color of life to fade, like death, led the Muslims to become the most prolific and profound craftsmen who made works throughout history that reflected this inner beauty. Thus, a new path was designated for people, granting them the grace of searching for beauty in everything they performed and realizing the beauty that lies within the universe. This prospect, which takes its principle from the tawheed that is in harmony with the beauty created by Allah, surrounds even the daily life and leads the aesthetic to acquire a divine quality that is reflected in all the beauty of the world. We ask Allah to ordain us to become those who create new beauty in our efforts to reach the beauty of servitude. Beautiful wisdom. Thank you for sharing. A beautiful account of this very sad event- very interesting and informative, thank you.